FTC Block Difficulty analysis 500 difficulty MHash "attack"
It can be seen that a very large hash rate was directed at FTC at 9am, 12:30pm, 22:30 and 8 am 11/09/2017. 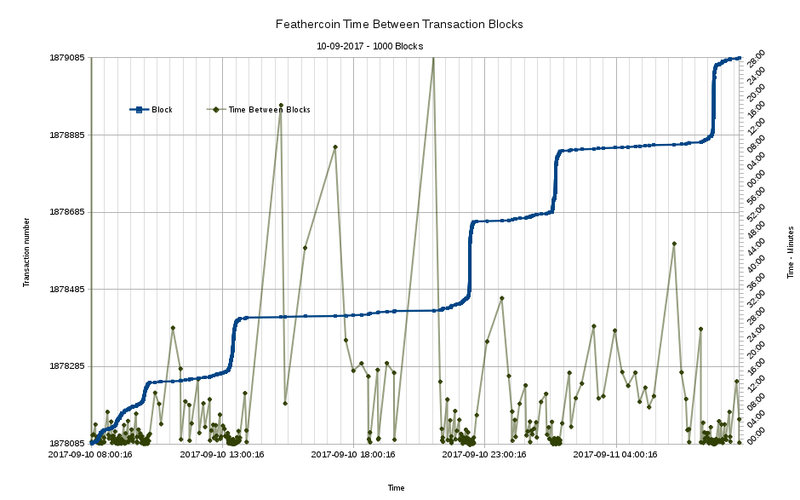 Transactions 1878844 and 1878869 were not done during high hash rate, so had long transaction block confirmation times. The temporal anomaly is due the time of these blocks being slightly before the previous block, however its within a “normal margin”, especially with such a large over hash rate of ~50 times. 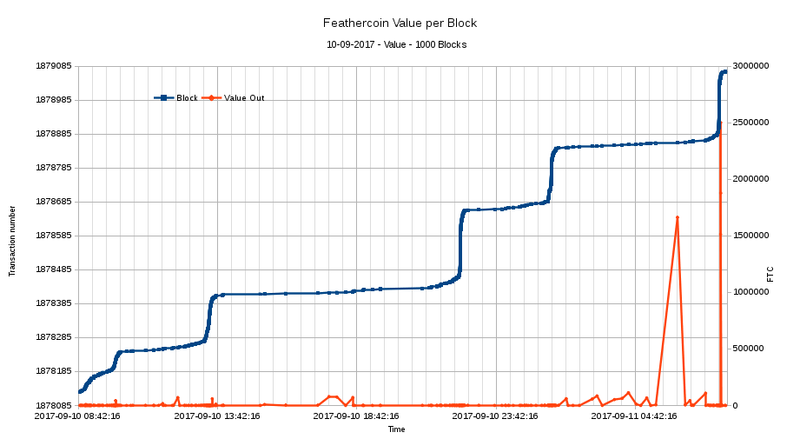 The Feathercoin difficulty has increased to an average value of 36, with peak values near 500. The hash variations is much larger than previous analysis, showing very high levels of hash power being directed at FTC. Almost too high possibly indicating a very large pool or some new equipment available to one miner. There were 167 minor time anomalies in the blockchain timings for the 1000 min test period. Many of those time anomalies were due to Blocks with the similar times, before. FTC is routinely analysed if there are any concerns. These analysis are stored on Github to use as templates or review historical analysis. Values of the parameters analysed can be extracted from FTC debug file. The ABE software used to produce sites such as http://explorer.feathercoin.com/chain/Feathercoin?count=1000&hi=1783533 does some of this work for you, so for sporadic analysis of a few days it is convenient to scrape the data from there. Normally the web site displays up to 100 blocks but this can be expanded manually. The data is accumulated in a text document, then pasted into the spreadsheet template from the last analysis. Charts and calculations data ranges are corrected as required. The block time has settled down to 1:06. The high block rate is still slightly evident. Probably changed to shorter duration burst to reduce difficulty increase. The below chart shows hashrate overlayed with difficulty and we can see the difficulty skyrocket but not the hashrate. Maybe these were only switched on for very short amounts of time ? enough to affect network difficulty but not enough to show up in the Bitinfocharts graphs ? given the fact, that the difficulty is calculated based on an average of hashrate and also damped, and that the high hashrate peaks where relatively short, I think the difficulty reacted as designed. am I stupid ? the dashed lines raise in my image is in june… ? you may need to change the time frame and duration ? yu may need to change the time frame and duration ? @AcidD You are probably seeing the effect of different averages. That’s why I look at the actual difficulty. The only way to calculate the hash rate is from the difficulty, which is calculated from the times of previous blocks. So assume the worst for a minute: someone privately has figured out ASIC mining neoscrypt and is planning a sustained attack? What’s the contingency plan? I think i remember years back a discussion that if that ever were to happen, the devs would race to put together yet another unique algo to make it ASIC resistant again. I understand trying to plan for the worst but my first thought here is why would someone do this? Developing an ASIC for NeoScrypt for the purpose of attack is foolish. ASICs are crazy expensive to develop and if used only to attack the network there is no recoup of that investment. The better option would be to develop it and mine all NeoScrypt coins for profit. Or sell the ASIC miners to the public. @AmDD This is all very true. But at some point as there are fewer and fewer surviving old coins, it’ll make sense for them to try and disable each other. Profitable not directly, but by disabling the “competition”. (or it may appear smart to do so and someone does it, i think these kinds of attacks would hurt trust in all coins tho and be stupid). There are a lot of unpredictable instantly now rich people out there, who knows what they might do. Or a less nefarious situation. FTC price rises to the point where developing an ASIC miner does make sense. Just wondering if the long term goal is to remain a GPU-minable coin or if ASIC would be embraced? @Wellenreiter Cool, thats what i thought. ASIC isn’t something i’d want to embrace for FTC either!